Capitalizing on the absence of Minecraft on both the Wii U and 3DS, Re-Logic’s 2D sandbox game Terraria is coming to Nintendo platforms in the first quarter of next year. Publisher 505 Games recently announced that both versions will feature touch-screen controls and also support online multiplayer – 8 players on Wii U and 4 on 3DS. However it’s the local multiplayer of the console versions of both Terraria and Minecraft that have hooked families fastest. On that front the Wii U version will support up to four players in its split-screen local multiplayer mode.Terraria offers a similar open world experience to Minecraft. Launching on PC in 2011 it then headed to Xbox 360, PS3, Vita, iOS and Android in 2013. In November 2014 it came to PS4 and Xbox One. It will be interesting to see how the developer makes use of the Wii U’s touch screen interface. This has the potential of leaving more screen real estate for the action while offering constant access to menus. In my family Terraria has eclipsed Minecraft in terms of popularity with the children preferring the more story-led game-play despite the more limited two dimensional play-field. This, combined with the four player split screen collaboration has proved a compelling experience. You can follow their progress with the game via their Let’s Play Terraria video series. 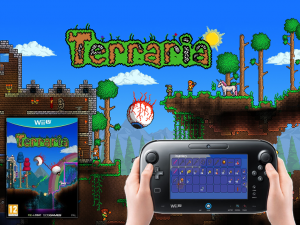 Either way, Nintendo owners will be keen to get on board with Terraria with Minecraft not forthcoming on the playform. Terraria on Wii U will be on demo at Gamescom next week, I’ll check back with a hands on report.